Fifty of the positions will be cut from corporate headquarters in downtown St. Louis. A spokeswoman said the employees would receive severance, extended benefits coverage and outplacement support to help with the transition. The layoffs are expected to take effect in the second quarter. Peabody Energy said it will also close offices in Evansville, Indiana and Gillette, Wyoming. The company also plans to adjust mine production in Australia. "To remain most competitive in the current environment, Peabody is implementing a number of initiatives in the operational, SG&A, financial and portfolio management areas of our business," Kellow said. Coal companies have struggled in recent years as natural gas prices remained low and more regulation over carbon emissions have been implemented. Patriot Coal, formerly headquartered in St. Louis, filed bankruptcy last month for the second time in just under two years. Missourians Organizing for Reform and Empowerment (MORE) sent out a statement Monday asking what would happen to tax breaks given to the coal company. 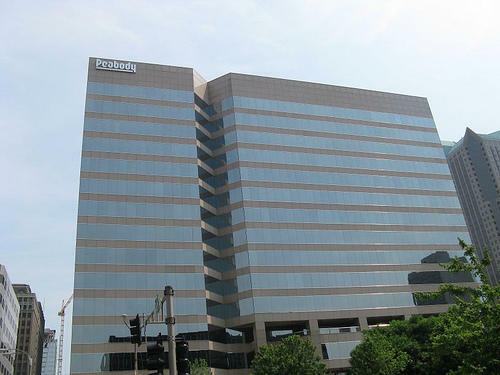 In 2010 the city of St. Louis approved a tax break to encourage the company to keep its headquarters in the city. MORE said the tax incentives amounted to $61 million. However, the city has put the figure closer to $4 million.